A parade arrived at noon today, bringing a steel girder from the World Trade Center towers in New York, to be used in a Tenth Anniversary Memorial in Freeport. 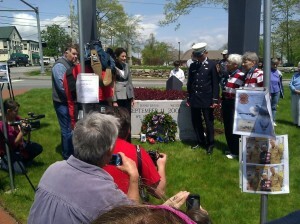 Speakers included US Sen. Olympia Snowe, as well as spokespersons for the rest of Maine's US delegation. The guest of honor was retired. NYFD Lt. Mickey Kross, who shared his commitment to the remembrance. The steel girder will visit other Maine towns before being cut to be used in the memorial. Freeport's Flag Ladies were recognized, along with the Masons and others , for making possible the gift of the steel from Ground Zero.